Non enveloped, large (50 nm diameter) icosahedral particles composed of 420 subunits with a T=7 symmetry . The virion shell is covered with virion associated protein (VAP) . It has not been described whether handedness of capsid is laevo or dextro, here the pictures dsplays a laevo form. Monopartite, open circular, double stranded DNA of about 8000 base pairs with discontinuities in both strands: one in the transcribed strand and one to three in the non-transcribed strand. Codes for 6 to 7 proteins. 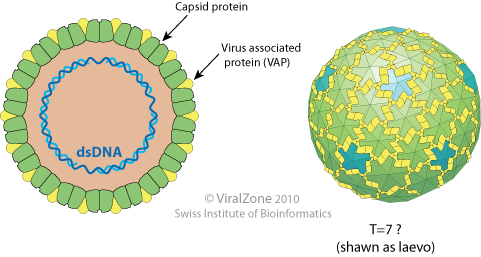 35S RNA and 19S RNA translation produces viral proteins.